Rendering of a new office in South Lake Union that Facebook is going to lease. Courtesy Vulcan Real Estate. Seattle is already home to Facebook’s largest engineering office outside its Silicon Valley headquarters, and the company is leasing another large South Lake Union project. Facebook, which just opened a big Seattle office, is expanding again by leasing a pair of new South Lake Union buildings with the potential to double the tech giant’s presence in Seattle. 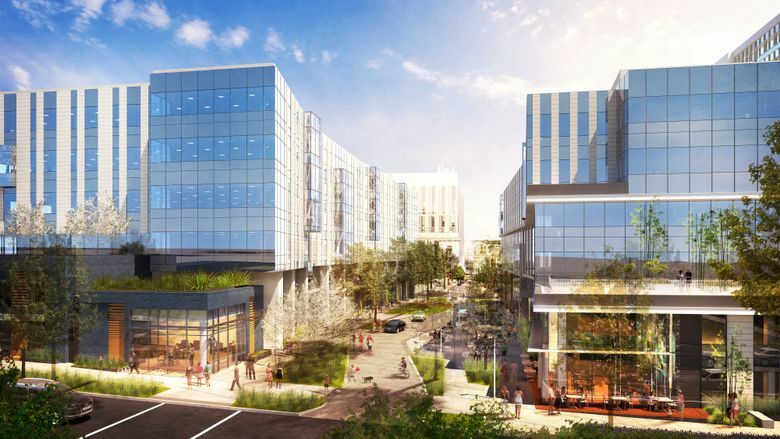 Paul Allen’s Vulcan Real Estate announced Friday that Facebook will be the sole office tenant of its new $246 million Arbor Blocks project, which just got under way along Eighth Avenue North between Harrison and Thomas streets. It’s the latest tech expansion in the rapidly changing neighborhood. The offices will sit in the shadow of one of Amazon’s new midrises right next door, and a few blocks down the street is Google’s upcoming South Lake Union campus, where construction is set to start next month. The two latest Facebook buildings will total 383,900 square feet of office space when they open. For perspective, Facebook just last spring moved most of its roughly 1,000 employees in the area into a new building on Dexter Avenue North that is 335,000 square feet. The current Facebook office has potential to hold about 2,000 employees total, and the upcoming offices are slightly bigger, meaning the company could eventually top 4,000 employees locally. Construction just started this week on the Arbor Blocks project, which consists of two six-story offices with ground-floor retail. Facebook could move in during the third quarter of 2018. “I think they’re a great fit for the neighborhood and the project,” said Lori Mason Curran, a Vulcan Real Estate executive. The Menlo Park, Calif.-based company first opened a small office in Seattle in 2010 — its first engineering satellite office in the country — with plans for just a few Seattle employees. After some big growth, the city now houses Facebook’s largest engineering outpost outside of its Silicon Valley headquarters. Facebook and other companies have been particularly interested in the tech talent abundant in the Puget Sound region, where housing — while increasingly expensive — is still far cheaper than in the Bay Area, making it easier to attract and retain employees. For Facebook, Seattle-based teams already have led development of the Facebook Messenger chat service’s video calling and the “cold storage” technology that helps company data centers more efficiently store the photos and other content people post to the social-networking site, among other initiatives. “Seattle is really a key part of our long-term mission,” Mike Schroepfer, Facebook’s chief technology officer, said in May. Facebook on Friday confirmed the lease but otherwise declined to comment. The new outpost is about half a mile from the company’s brand-new building that just opened in May. The latest campus will include many of the amenities that have become standard in tech offices, such as bicycle parking, showers and public art. As the Arbor Blocks name suggests, there will be a large canopy of mature sweet gum trees outside, including in an open space dividing the two offices. But there will be a unique feature: A section of Eighth Avenue that splits the two new buildings will be turned into a $2.1 million “woonerf,” a parklike, zigzag street where motor vehicles must be driven extra slowly and pedestrians and bicycles have the right of way. The site has had warehouses and a former King County library building, which are being demolished, along with a parking lot. The project has been in the works since early this decade. Vulcan first bought the site for $8.5 million in 2000. Vulcan is also set to start building the new Google campus in South Lake Union and has built most of Amazon’s constellation of buildings in the neighborhood. One of Amazon’s newest offices, the 12-story Apollo, sits right next door to the newly announced Facebook site and was also built by Vulcan. And Amazon has three additional new offices just a block or two away. “It really solidifies the vision that we’ve had for this neighborhood all along for being a really important economic engine for the region and being a center for job growth,” Mason Curran said. Still, the increasing tech presence in the neighborhood hasn’t been welcomed by everyone: It has displaced longtime tenants and contributed to rising housing prices and more gridlock on roadways. Mason Curran said Vulcan had been sitting on the Arbor Blocks project since receiving early approvals from the city in 2013, waiting to pre-lease with a tenant before starting construction. She said it had been marketing the space and learned Facebook was looking for about 400,000 square feet of new offices. She added that Vulcan’s recently approved Google project, which totals 621,000 square feet of offices across several buildings, will begin construction in January, with the campus to open by early 2019.